A single Graph or Map can change dramatically over the lifetime of a case and represent hours of investigative work. 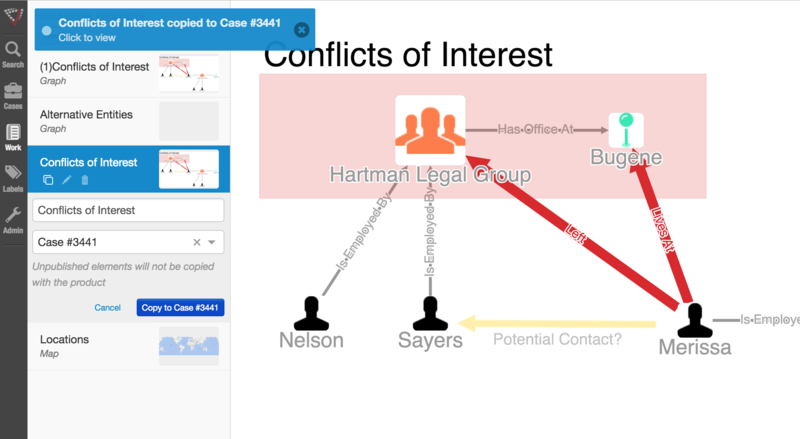 With the 4.2 release we wanted to allow you to continuously leverage that work as your cases or investigations evolve. To do this, we’ve added the ability to create copies of your work products and move them to other cases. Of course, copying the state of a Graph or Map also includes the formatting rules, annotations, and other configurations you’ve added as well. Now that you can create copies of entire Graphs or Maps within your case you have the freedom to explore new “What If?” scenarios without losing your initial work. Whenever you want to break off for a new “What If?”” scenario you can create a copy of your current Graph or Map. Then, if your prior work turns out to have been the correct route, revert back to using the original. This is also great for cases with collaboration. You can quickly create copies and then make changes without interfering with other users’ work in the same case. In some situations, work that has been completed in one case could include published data that is relevant to other cases or investigations. Now, with the ability to copy these products into other cases, that prior work can be immediately leveraged in any new case you copy it to.